Are you looking for a truly unique and personal piece of jewelry? Rena C. Campbell creates inspirational necklaces and fob charm dangles that will appeal to anyone looking to achieve harmony and balance in their lives. The above-pictured “Imagine” charm is just one of the 9 Feng Shui life paths from which you can choose. More than mere good luck charms or handmade beaded jewelry, these unique necklaces and fob charms by artist and designer Rena C. Campbell, bear inscriptions of the corresponding nine positive affirmations for each of the life paths. With the wearer’s intention and focus, the affirmations on our unique handcrafted jewelry accomplish more than usual inspirational jewelry. One subtle way to keep your mind focused on the Feng Shui life path you are following is to have a beautifully crafted silver affirmation charm clipped to your purse or your belt loop. These inspirational Dangle charms are a 7/8″ diameter fob cast in solid nickel/silver. They hang on an oval link nickel-plated chain that connects to the nickel-plated swivel snap hook. The semi precious crystal quartz stone is highly polished and each stone is unique in its beauty. How do you know which tag to choose? Whatever path calls to you will be the right one. Imagine – Why can I Imagine what my life can be? Love – Why do I always come from Love? Health – Why do I enjoy such perfect Health of mind, body & spirit? Wealth – Why am I so happy being so Wealthy? Peace – Why is Peace all that is? Joy – Why am I filled with Joy? Journey – Why do I welcome clarity on my Journey? Wisdom – Why do I have the Wisdom to always know what to do & say? Spirit – Why is my Spiritual life in perfect balance & harmony? The day that I was asked to pick my path, the “Joy” charm was calling to me! 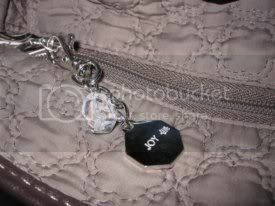 My Joy dangle and its crystal quartz bling is now worn on my purse (see above picture) – although I just might change it to my key ring so I can look at it even more often! Right now, I see my lovely Joy charm several times throughout the day and each time, it reminds me to find Joy in my surroundings. Being filled with joy makes me calmer and happier and a much more pleasant person to be around. Shop online at Talk To The Turtle and see what path is calling you. (And feel free to come back here and let me know which one it was, I’d love to hear your comments!) Customize your dangle to your desired length as well as with or without the quartz crystal. Disclaimer: I was provided a Silver Charm Dangle free of charge for review purposes. All opinions expressed are my own, based on my personal experiences with the product.